EUR/USD is trading sharply lower ahead of the European Central Bank’s monetary policy announcement. Over the past 6 weeks there’s been widespread deterioration in business activity prompting investors to position for a dovish outlook. Even Germany’s Bundesbank head said recent indications for Germany in the first quarter were “not so brilliant.” However we can’t assume overwhelming dovishness from Draghi because last Friday he also said their confidence in the inflation outlook increased as the growth momentum is expected to continue. Inflation has also been on the rise so underneath the weakness there are positive developments. The question for Thursday is whether recent deterioration overshadows the uptick in inflation and positive growth momentum. We know that the ECB is not ready to raise interest rates and they certainly don’t want to see EUR/USD back above 1.24 because that would offset the improvements in prices. Yet they also want to end QE purchases this year -- so Mario Draghi has quite the balancing act to do on Thursday. If ECB is dovish and the EUR/USD falls, the next stop should be 1.2100, which was resistance in early January and then 1.20, the 200-day SMA. 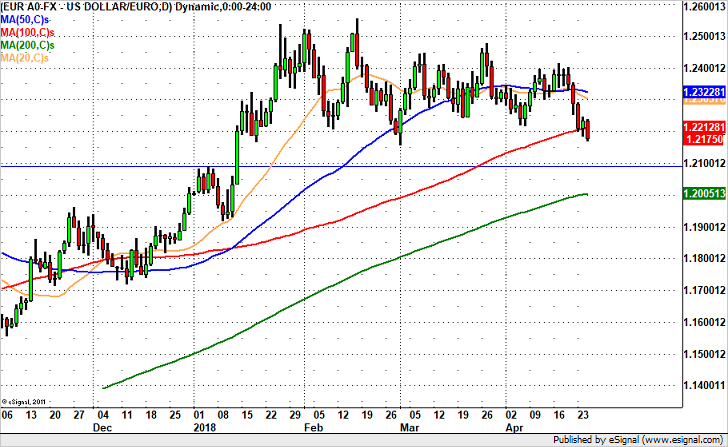 EUR/USD has already broken below the 100-day SMA so the path of least resistance is lower. If they are not as dovish as investors anticipate and EURUSD finds itself back above 1.2250, the rally should extend to at least 1.2320. We are laying out a short EUR/USD order post NFP. October is off the table but we are still looking for the Fed to raise rates in December. EZ data has been terrible and we have a number of German reports that should show ongoing weakness and a persistent need for the ECB to keep monetary policy easy. We are laying out 2 Big Trade orders post FOMC. The Federal Reserve left interest rates unchanged today, citing uncertainty abroad and slightly softer inflation, which is bearish for the U.S. dollar but as Yellen indicated, recent developments have not fundamentally altered their outlook for the U.S. economy. She said every meeting is a live meeting and an unscheduled press conference could be held in October if needed. We don’t believe that will happen but December remains a strong possibility for a hike. We like selling USD/CAD in the near term because the lack of a rate hike could cause additional weakness in the dollar and lift oil prices. This “risk on” sentiment should drive USD/CAD to 1.3000 especially if Friday’s CPI report surprises to the upside like we anticipate. We like laying out orders higher to sell EUR/USD because ECB officials continue to talk of the possibility of more QE, which should limit the gains in the single currency.